Racing stripes were originally applied to race cars to help spectators identify them on the racetrack, and to help a driver align with the road. That was then and this is now! 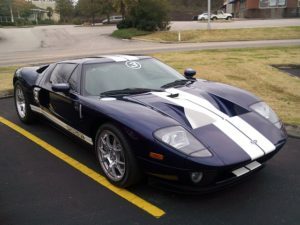 Let Metroplex Wraps install a custom set of vinyl racing stripes on your car in the color and size of your choosing! You can select the finish of your stripe in gloss, matte or satin. We can also custom design a printed graphic racing stripe in multiple full color. The sky is the limit and we can make it happen! Give us a call to see the different options for vinyl racing stripes in Fort Worth, TX or any location in the DFW Metroplex & surrounding area. We can also accent other parts of your vehicle in the same material to help make an even bolder statement! Rocker panels, mirrors, trim, grills, or bumpers can all be wrapped in high-quality vinyl with the design of your choice. Your racing stripes are no longer confined to the painted surface of your car! If you would like to explore vinyl racing stripes or add some flare to other parts of your vehicle in the DFW Metroplex or the surrounding areas in TX, call Metroplex Wraps today! The 1965 Ford Mustang GT 350 would be the first road car to implement racing stripes as a factory option. Different styles would be seen wrapping around the side of the car rather than down the center, and these are generally referred to as “bumblebee stripes”. The Dodge Charger Daytona car prominently features bumblebee racing stripes. The Dodge Viper GTS began sporting 8″ racing stripes in 1996, prompting a new interest in the fashion. These are sometimes called “viper stripes”. Today, there is an unlimited number of options for color, width, style, and finish when it comes to vinyl racing stripes. Whether you want matte, satin, chrome, or metallic racing stripes, we can design them with a variety of colors, and we can even print custom graphics or camo racing stripes! Updated on September 19, 2018 at 9:04 pm by Metroplex Wraps.